While we love getting pastries in France, we also very much like going to the table service restaurant - Les Chefs de France (I think it might have something to do with my children's obsession with escargots). Today's review is written by my good friend Shannon. 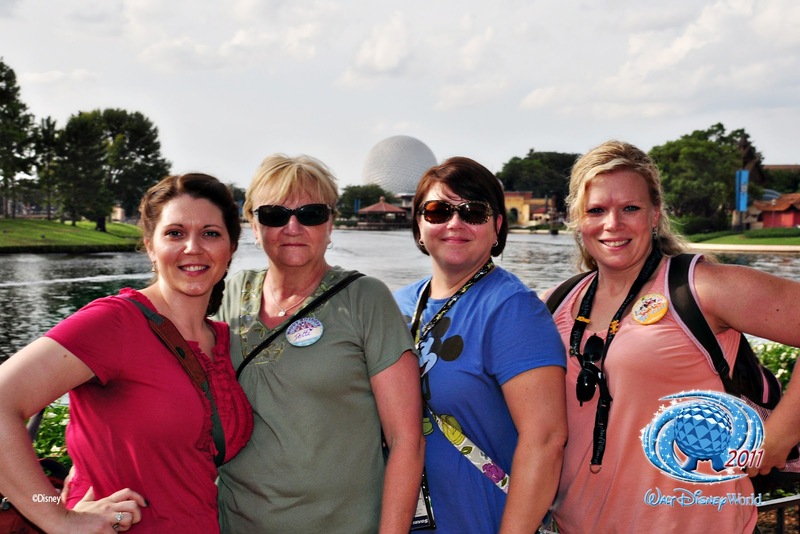 Last August, Shannon was part of TWO girls trips to Disney (one of which was with yours truly - and if you haven't done a girls/adults only trip - I can't recommend it enough!) - and she has graciously agreed to share some of her thoughts from the trip. Look for more reviews from Shannon after she comes home from her next trip this October when she'll be celebrating her and her husband Shane's 15th anniversary - and celebrating yet another adults only trip! 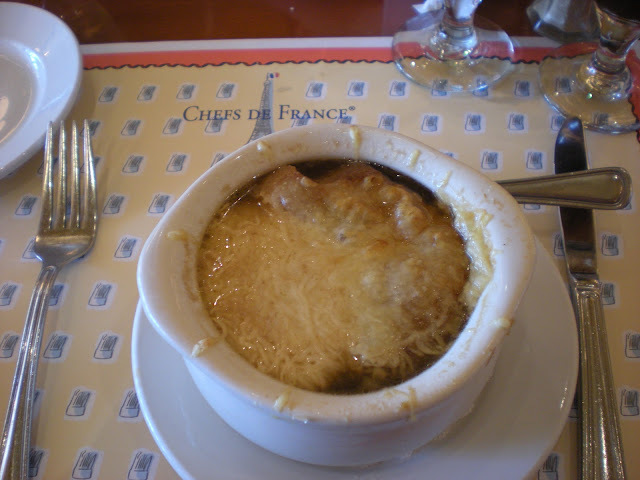 Last September, I had lunch at Les Chefs de France during a "girls only" trip to Disney World! Along for this trip was my mom; my sister, Heather; and my friend, Helen. 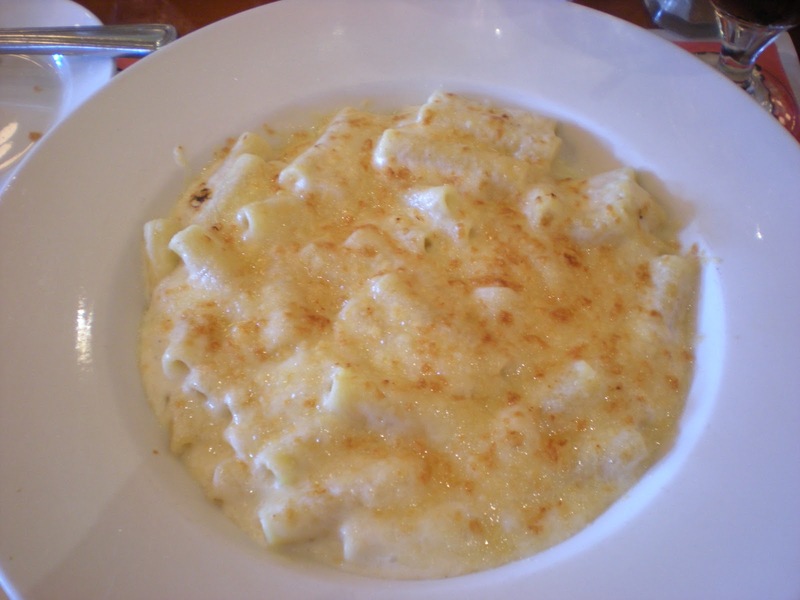 This was the first time any of us had dined at Les Chefs, and we were really looking forward to the meal. It didn't take us long to decide what I wanted to eat: I ordered the Prix Fixe 3-Course Lunch. I had my choice of appetizer, entree, and dessert. The soup was superb… and the bowl was huge! 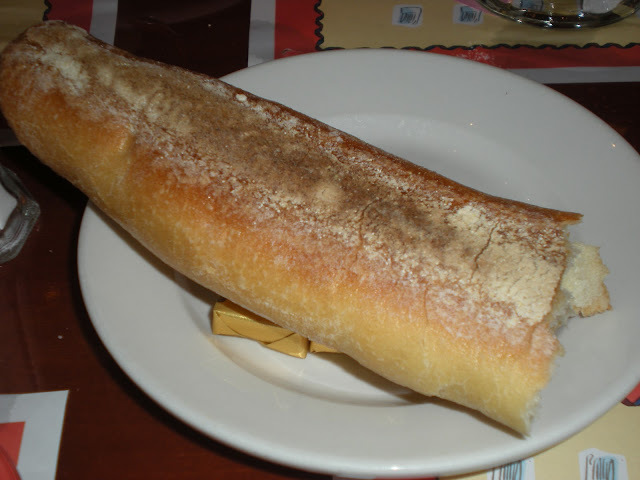 I could have easily made a meal out of just the soup and the baguette. Another huge and delicious portion! After the soup and bread, I was already getting a little full… I think I only managed to eat half of my entree, and that's because I knew dessert was still to come! I was very pleased with my dessert. 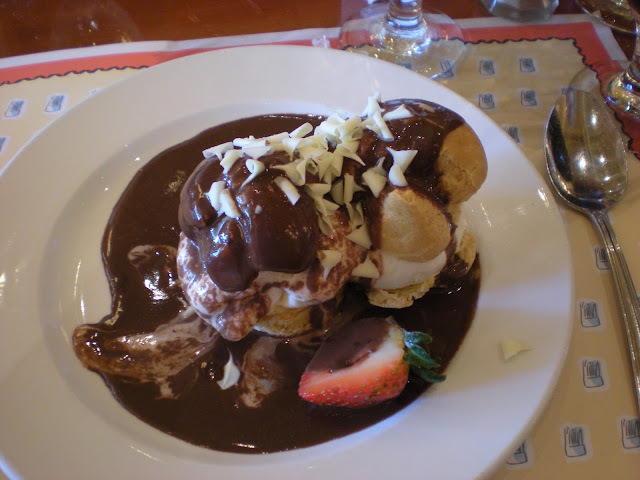 The only negative I had about the profiteroles is that the chocolate was bittersweet… I would have liked it better had it been milk chocolate. Les Chefs de France was très bonne! The service was great... our waitress was a total sweetheart. Every dish was délicieux and the portions were plentiful! There are several dishes on the menu that sound yummy… I would love to come back for lunch at Les Chefs sometime to give them a try. And the interaction with Armand and Remy was so fun! I definitely recommend lunch at Les Chefs! Thanks again to Shannon for sharing! So...what about you? Do you have a favorite French food? Mmmm, that soup. And macaroni. And the bread. Really, it was all soooo good. When Shane and I were trying to decide where to have dinner on our Epcot day for our October trip, my mom couldn't believe we'd even have to think about it... her choice would be Les Chefs, hands down! Thank you for making me drool. I LOVE French food. I'll eat it all. I showed Ailey the picture of Remy and she almost had a stroke from excitement! She begged me to figure out a way to let her meet Remy too while we're there in October. Good thing I requested that ADR! 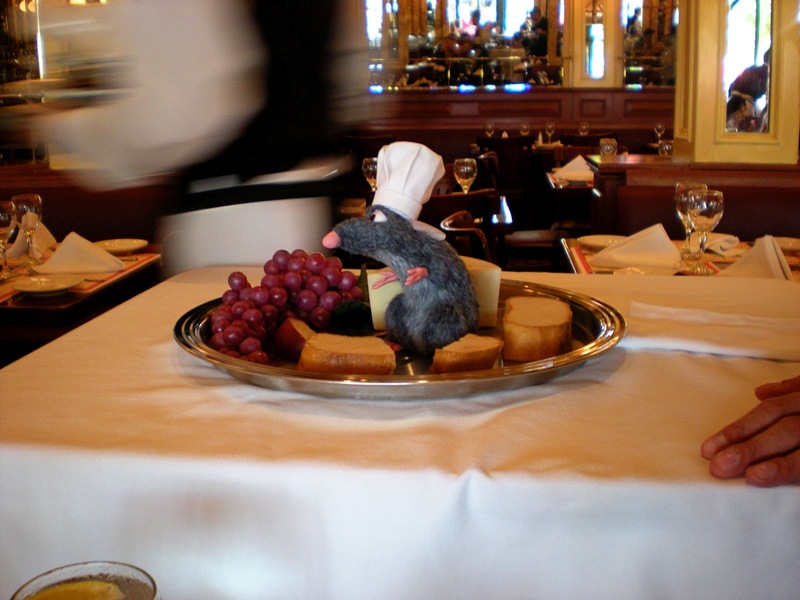 Our upcoming trip in October will be the first time in years that we've not dined at Les Chefs, but only because it's Food & Wine Festival and we've decided to forgo ADRs in favor of snacking around the World. (Well--of course we have a nighttime ADR for Rose & Crown--hello, Illuminations!) But we LOVE Les Chefs. And we also love croissants--which always taste better if you eat one just before or immediately after a viewing of Impressions de France. p.s. Shannon--you and your sister are ADORABLE.